Skincare group Vaseline has introduced a skin-lightening application for Facebook in India, enabling users to make their skin whiter in their profile pictures. The download is designed to promote Vaseline's range of skin-lightening creams for men, a huge and fast-growing market driven by fashion and a cultural preference for fairer skin. 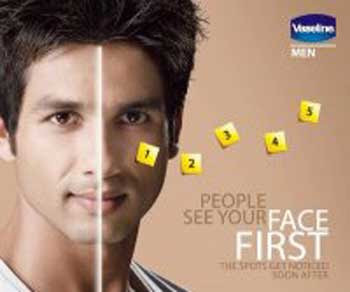 The widget promises to "transform your face on Facebook with Vaseline Men" in a campaign fronted by Bollywood actor Shahid Kapur, who is depicted with his face divided into dark and fair halves. "We started campaign advertising (for the application) from the second week of June and the response has been pretty phenomenal," Pankaj Parihar from global advertising firm Omnicom, which designed the campaign, told AFP. In 2005, Indian cosmetics giant Emani launched the first skin-whitening cream for men, called "Fair and Handsome", 27 years after the first cream for women. Since then a half dozen foreign brands have piled into the market for men, including Garnier, L'Oreal and Nivea, which promote the seemingly magical lightening qualities of their products in ubiquitous advertising. In 2009, a poll of nearly 12,000 people by online dating site Shaadi.com, revealed that skin tone was considered the most important criteria when choosing a partner in three northern Indian states.